I make no secret of the fact that I am almost as crazy about wild and undone British floral design as I am about film photography. Inspired by Constance Spry, pioneered a little over a decade ago and made famous by florists and growers like Sarah Winward and Floret. Now, these modest cutting gardens offering strictly seasonal arrangements are on the increase. This is really good news. Such a huge variety of flowers grow here in the UK right through from March to November. Why settle for a tight bauble of white roses on your wedding day when you can have a resplendent reflection of what’s growing in our meadows and gardens? Holly-Bee Flowers is a flower garden and floral design studio based in Dartington, Devon. Holly specialises in growing and arranging flowers and greenery for weddings, workshops and bouquets. Working with the seasons her flowers are natural, evocative and beautiful. Holly created Holly-Bee Flowers in 2015, with a background in design and a love for colour, texture and growing flowers. Natural beauty is at the heart of what she does. 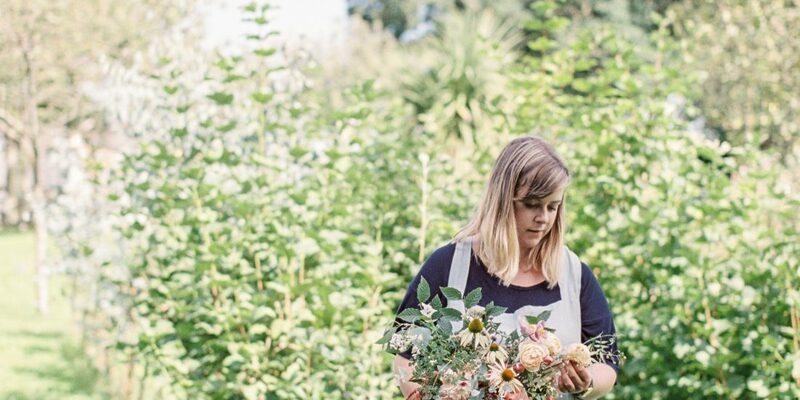 She grows most of her own flowers and foliage in a quintessentially English country garden. She is a firm supporter of British flowers, and also sources from local suppliers where required. As you can imagine I was over the moon when Holly asked me to photograph her and her wonderful garden in the heart of rural Devon late last summer. It was a very warm day and I wasn’t sure if I was working or playing. I was in my own bit of heaven on earth with Holly’s stunning roses and my film camera. As our English gardens and hedgerows burst into life for another season of beautiful blooms, here’s a brief look at Holly’s cutting garden and a few of her lush creations. Do also head over to Holly’s own blog, where you can see more stunning British floral design and her flowers through the seasons – she’s pretty handy with her digital camera so there’s lot of lovely photos to see. Would you like your own bespoke quote for natural business brand images? Canon 1V and Fuji Pro 400H, developed & scanned by Exposure Film Lab.